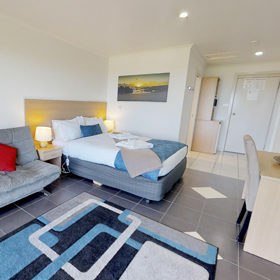 Island Breeze Motel provides modern and comfortable motel accommodation for those looking to stay close to the main township of Currie, or those who wish to explore King Island from a central location. 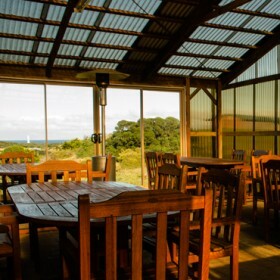 Situated just one kilometre from Currie central, you can easily walk there and explore the galleries, shops and harbour before enjoying a meal in town. 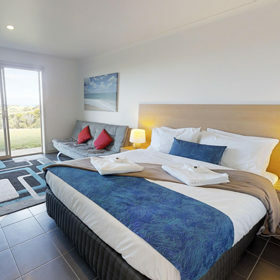 Island Breeze Motel offers Deluxe Rooms; which have been recently renovated. 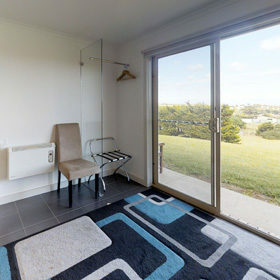 These open plan rooms have large glass doors allowing natural light and lovely outlooks to the coast and Currie Lighthouse. The motel is set in quiet surrounds, and don’t be surprised to see wallabies and wild turkeys on the motel lawns outside your room. A continental breakfast is provided daily, using local produce and bread. Amenities include an enclosed BBQ area. Seating up to 25, it is ideal for groups or friends to enjoy a meal or drink together. 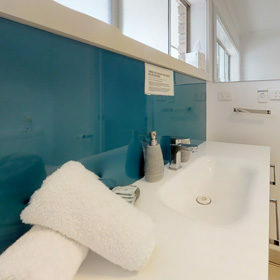 "We stayed in a 2 bedroom apartment, it was beautiful, clean and very spacious. Julie was were very kind and obliging. There was a great assortment of breakfast items for each morning in the room.. Can not fault anything. Highly recommend." 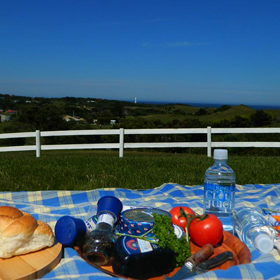 "We went as a family to run in the King Island Imperial 20 and stayed at the Island Breeze. Julie was super accommodating and helped plan our stay. The A-frame cottages were super comfortable and had everything we needed. Highly recommend when you visit." "The hotel room was clean & spacious. Heater was on when we arrived so room was warm & inviting. Continental breakfast was a great way to start the day. Fresh towels daily. Julie was very friendly and helpful and went above & beyond to return a forgotten item to me. Short drive to airport, Currie & cheese factory. Highly recommend staying here." "We booked two A-frames for our family with two young children and two sets of grandparents. Everything we needed in a lovely location, conveniently close to town. Helpful and friendly service from the minute I made an enquiry - couldn't have asked for more. My two-year-old was sorry to have to say goodbye to 'nice Julie'. We'll be back!" "It is very nice small motel with excellent view. Rooms are very clean. They serve breakfast. Very clean shower with excellent hot water run. You can walk to lighthouse and fill your lungs with beautiful ocean air."